We got that three story structure in this episode, so let’s just start with Character’s past. This one centers on young Snow White. Snow White’s mother, Queen Eva is dying and Snow White ventures to find the Blue Fairy. The Blue fairy says the only way to restore the queen’s life is for someone else to die in her place and gives Snow a candle that will switch the lives. Very Game of Thrones. However young Snow can’t bring herself to do it and Snow’s kind mother dies. Turns out that Eva was poisoned by Cora who also disguised herself as the Blue Fairy to test Snow White and to lead Snow on a path of darkness. It also seems like Eva and Cora have a little bit of a history. In New York, everyone is awkwardly trying to bond and then Hook stabs Rumpelstiltskin with a poison tipped Hook. Rumpelstiltskin says he will die unless they can make it back to Storybrooke. Neal/Baelfire says that the fastest way is to steal Hook’s boat and says he can captain it. Basically Neall did go to Neverland! Was he Peter Pan? Seems like it? Would make sense though Pan learning to sail a Pirate boat? Seems a little off. Maybe he was rouge lost boy? Don’t know I asked that question back in episode 4. Also Emma meets Neal’s fiancee Tamara. The trouble is back in Storybrooke, Regina and Cora are after Rumpelstiltskin’s dagger. Snow calls Emma asking Rumpelstiltskin to reveal the location of the dagger. He tells them and they find in the clock tower of the library but Cora and Regina show up and threaten one Snow’s former loyal servant Johanna. Snow trades the dagger for Johanna’s life but Cora kills Johanna anyway. Snow then vows to kill Cora for what she did to both Johanna and her mother as she just learned of Cora’s manipulations and murder of her mom. First off, there is a huge Star Wars reference. Snow White/Mary Margaret says the classic Leia line to Mother Superior, “Help Me Mother Superior, you’re my only hope. Generally, I liked this episode. It was good to see a young Snow White be the focus of an episode and yet more character motivations in play. This has to be one of the strongest episodes yet. It explores Cora’s backstory and her rise of a Miller’s daughter to royalty and her lust for power. So in the character’s past, Cora is a Miller’s daughter or more specifically the Miller’s daughter from the Rumpelstiltskin story. She is delivering flour to the King but Princess Eva trips and her and forced to kneel and apologize for doing nothing wrong. Cora attends a ball for the hand of Prince Henry, who is being whored out for a wealthy alliance. Cora tells the king that she can spin straw into gold. So he locks up in a tower and should she produce gold she can marry Henry. Rumpelstiltskin shows up and offers to spin the straw into gold for her if she gives him her first born. She agrees but on the condition that he teaches her how spin gold instead, he agrees. Their lessons gets a bit sexually charged but she masters the process. Cora and Henry become engaged but he is fifth in line to be King which doesn’t suit Cora. Her and Rumpelstiltskin are also having an affair. Rumpelstiltskin offers her love and asks her to run off with him. They amend their contract so that she would own him his child and he teaches her how to remove hearts so she can kill the king. She instead removes her heart as “love is weakness” and tells Rumplestiltskin she will not be going with him and any child she have will not be his. In Storybrooke, Rumpelstiltskin is dying and Cora seems like she wants the power of the Dark one. Rumpelstiltskin manipulates Snow to use that candle to exchange his life for Cora’s and tells her that the heart is in the vault. Snow manipulates Regina to give Cora’s heart back so that Cora will finally be able to love her. Right before Cora is about to kill Rumpelstiltskin, Regina restores Cora’s heart thus killing her and saving Rumpelstiltskin. Both plot were great, one of exciting and somewhat suspenseful and the other was intriguing. Personally I prefered Cora’s and Rumpelstiltskin’s past. 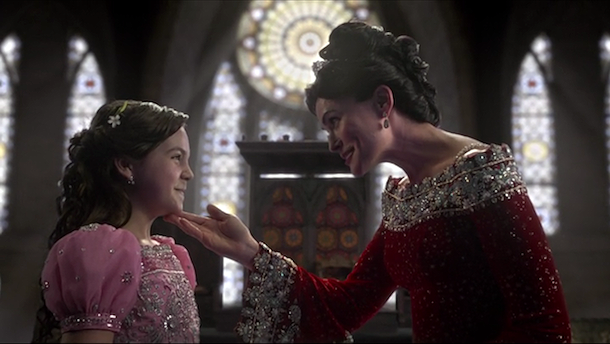 It was great to see what motivated Cora to her icy yet power hungry persona and also it gave the reason behind Rumpelstiltskin and Cora’s relationship which has been hinted at for a while. It does beg the question is Rumpelstiltskin Regina’s father? If Cora was pregnant in that instance, which it vaguely hints at it would make Regina Baelfire’s half sister and Henry’s aunt. But there is not clear indicator as of yet how much time passed between Rumplestiltskin and Cora’s affair and Regina’s birth and with Cora now dead it could be hard to answer that question if it is indeed true though it’s probably not true. Anyway great episode, one my favorites so far.